彭丽娟, 陆明勇. 山西地区跨断层流动形变监测探讨[J]. 大地测量与地球动力学, 2019, 39(1): 84-87. PENG Lijuan, LU Mingyong. 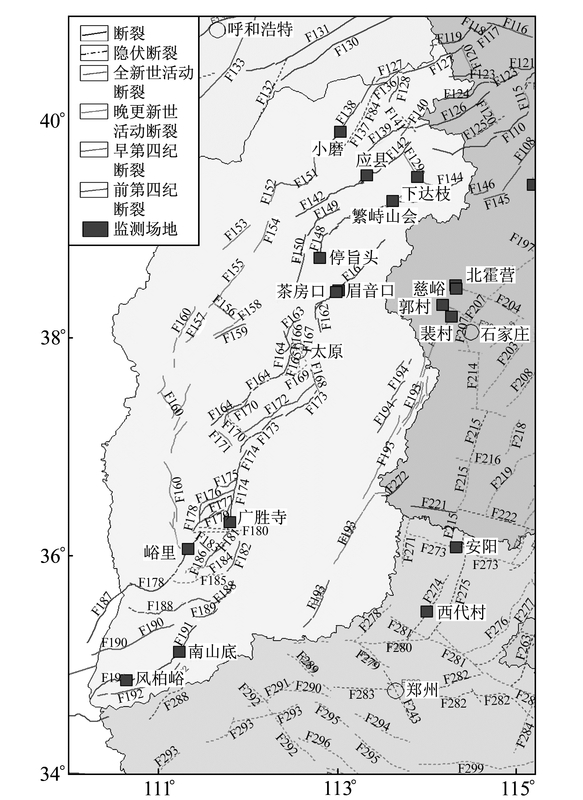 Investigation on Cross-Fault Deformation Monitoring in Shanxi Area[J]. Journal of Geodesy and Geodynamics, 2019, 39(1): 84-87. The Spark Program of Earthquake Technology of CEA, No.XH14057; Flow Deformation Observation Technology Communication, No.JC1704021033. PENG Lijuan, engineer, majors in earthquake precursors, earthquake monitoring, seismic activity, E-mail: plj0424@163.com. Foundation support: The Spark Program of Earthquake Technology of CEA, No.XH14057; Flow Deformation Observation Technology Communication, No.JC1704021033. About the first author: PENG Lijuan, engineer, majors in earthquake precursors, earthquake monitoring, seismic activity, E-mail: plj0424@163.com. Abstract: In this paper, first we analyze the basic data of cross-fault flow deformation monitoring in the Shanxi area. There is a great monitoring blind spot, the monitoring site monitoring means is single, most of the sites are not arranged as rings, and there are a lot of bedrock mixed monitoring sites in the cross-fault flow deformation monitoring. Then, the monitoring effectiveness is evaluated from the aspects of monitoring environment and earthquake response efficiency. There are serious environmental interference factors in individual monitoring sites, seriously affecting the quality of monitoring data. Finally, the monitoring optimization of cross-fault flow deformation is discussed and some suggestions are put forward to improve the capability and level of cross-layer flow deformation monitoring in this area.